I touched an empty spider’s web when I got home! Rhea arrived for her initial session with her mother walking before her from the front gate to the door, checking for spiders! That is how severe her phobia had become. A Phobia is always built on a well-founded feeling of fear. It is there for a good reason, and is not a fantasy. It can be difficult for those close to someone with an extreme phobia to imagine this, and well-meaning attempts to get them to ‘snap out of it’ can just serve to increase the anxiety. The sufferer knows the fear is irrational and feels doubly powerless because a phobia cannot be reasoned away. Rhea’s story of her lifelong phobia of spiders and their webs is a very good example of how the initial trigger which created it can actually be nothing to do with the phobia object. When clearing phobias, we need to pin-point the moment when the fear was laid down. It feels logical that a spider phobia was started by a spider, or fear of flying started with a bad flight experience. Sometimes that is true, but at other times the beginning could have been a strong shock or trauma completely unrelated to spiders or flying. The feelings of fear and panic can get attached to the spider or the experience of being in an aircraft at some later point. Hypnotherapy is particularly good at getting directly to the true initial event and neutralising its power to continue to stir up irrational fear in just one or two sessions. Rhea was 20 when she came to see me, at the end of her second year at University. She had an extreme fear of spiders which, as often happens, had got worse as she got older, and was now limiting her life severely. She could not go into the garden at home, especially after dark, walk down a path or through a park or sit on an outdoor chair or bench without someone to inspect and clear the way or brush down surfaces for her. But it wasn’t just real spiders that were the problem: “I couldn’t even look at spiders as cartoons on TV, and even a bit of fluff that looked like a spider would freak me out”. Now Rhea realised that her phobia was going to prevent her fulfilling her dream of travelling to areas of the world which not only had spiders, but much bigger ones that in the UK! This prompted her to try Hypnotherapy to clear her overwhelming fear of spiders. I followed the method I have found most successful in clearing phobias, using just two sessions. In the first one, having taken some background, I relaxed Rhea into the trance state and conducted a 20 minute hypnosis session to prepare her for the second session, in which we would use regression to find the initial cause of her phobia. Rhea went away with a recording of the 20 minute session which she listened to every day for the two weeks before coming back for the second session to clear the phobia. In the second session, we followed the feelings, now attached to spiders. Eventually we found a very early experience which involved a huge and sudden shock while being bathed at only a few months old, propped up in a sitting position in a baby bath. In just one split second while her mother’s back was momentarily turned, she suddenly felt her body lose its grip and start to slip down under the water. She was righted immediately, but this very traumatic split second (in which all her previous feelings of the world being a safe and secure place were turned upside down) would have sent a sudden and extreme wave of shock and fear through her body. In that instant, she would have learned that sudden, unpredictable, shocking things could happen and that life could switch in an instant from feeling safe to feeling extremely unsafe. Sometime later (probably having been startled by a spider) that extreme fear got attached to spiders. Rhea was sure that this was the first time her body had ever experienced the level of the shock and fear that were now so tightly associated with spiders and their webs. We went ahead and released the energy of that event in various different ways. It is very important to challenge the phobia immediately, once it has been released, in order to make sure we really have reached and successfully released the trigger event. Rhea was able to watch a slideshow of spider images without panicking, and to hold in her hand a very lifelike plastic spider which I gave her as a token of her success in the session. 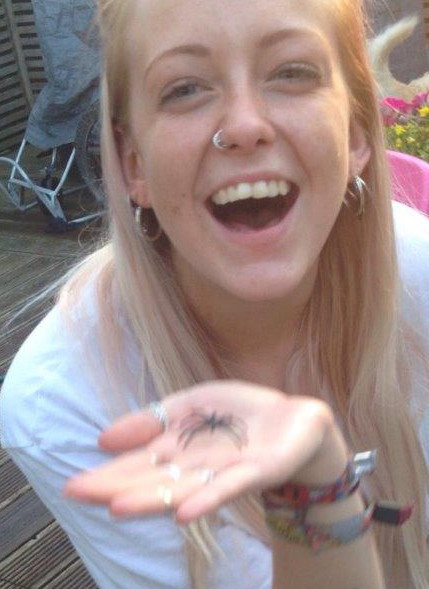 Below is a photo of her, holding the plastic spider later that day – something that would have freaked her out only hours beforehand. Rhea had a great time travelling the world! She encountered many spiders including some huge ones which would have scared anyone, but they did not stop her enjoying her trip or limit her in where she went. I am able to go through alleyways and bushes and sit on benches, chairs and ride my bike that’s kept in the garden without anyone having to wipe them down and inspect them which has improved my quality of life hugely. I’m still in the habit of looking for them everywhere I go but it doesn’t hold me back from any activities anymore. I still don’t like the idea of touching them or having them on/near me, (I mean big ones) and if they come out of nowhere and make me jump I move from the area and ask my boyfriend to put them outside, but I don’t get that feeling of deathly panic like I used to. I also enjoy nature documentaries about spiders now and find them to be quite fascinating creatures!